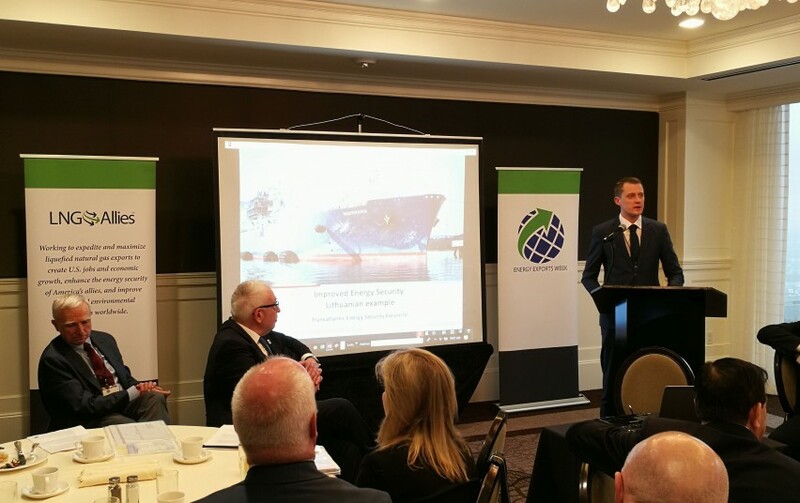 On March 19, Lithuania’s Minister of Energy Žygimantas Vaičiūnas participated in the Transatlantic Energy Security Forum in Houston (USA), where he presented the situation, trends and challenges of the Lithuanian and regional energy markets. During the forum, the main topic were the projects which ensure energy security in the region, also there was an overview of the activities and prospects of the Lithuanian and Polish liquefied natural gas (LNG) terminals. Opportunities for these terminals to supply regional users with LNG from alternative US gas sources were also discussed. In 2017, the first LNG cargo reached Lithuania from the United States, which confirmed that all of the technical conditions for the import of this fuel are suitable, and that from an economic point of view, US gas has all chances to successfully compete in the Baltic markets. The minister invited US LNG suppliers, who will already have the technical capabilities to supply additional quantities of gas in the coming years, to supply gas to the Baltic countries and Poland. Not only will this ensure energy security and more competitive prices for consumers – it will also broaden the possibilities for using LNG terminals on a regional scale. “The global LNG market is dynamic and continuously evolving, and the US LNG market is currently experiencing an upturn. There was recently a shale gas revolution, and new LNG export capacities are being developed as we speak which should create a significant supply of this fuel from the US by 2019–2023. We have to take advantage of the opportunities that are opening up, so now is the best time to make the contacts we need so that we can turn them into more concrete forms of cooperation later on,” said Minister of Energy Žygimantas Vaičiūnas. The third Transatlantic Energy Security Forum was also attended by Piotr Naimski, the Polish government plenipotentiary for strategic energy infrastructure, as well as Polish Deputy Minister of Energy Michał Kurtyka. The Polish representatives spoke about the already functioning infrastructure and the threats and challenges to energy security that are emerging. The Transatlantic Energy Security Forum is held by LNG Allies, an organisation which unites US companies involved in the export of LNG. The Minister of Energy will be in the United States the entire week, where he will meet with representatives from the US Department of State, Department of Energy and Congress. During the meetings with senior US officials, the Minister will present and discuss issues regarding energy security in the Baltic Sea Region, also the need for greater emphasis on nuclear safety will be discussed. There will also be a meeting with the United States Renewable Energy Association to share experiences in developing renewable energy. During his visit to the US, Mr Vaičiūnas will attend conferences on energy security and LNG issues, and will meet with US LNG exporters to introduce them to opportunities for supplying LNG to the region through the Klaipėda LNG terminal. The heads of state owned Klaipėdos Nafta and Lietuvos Dujų Tiekimas are visiting the United States together with the Minister.